The Red Hat Society is a social group for ladies 50 and older. There are a few of us who are not 50 yet, called pink hatters or pinkies. The idea for the club started with women who still have zest for life. We meet once a month at different host locations. Have you heard of the poem "Warning" by Jenny Joseph? It is better known as "When I Am An Old Women I Shall Wear Purple." That is what represents us. There are Red Hatters all over the globe. The rules of the club are "there are no rules". Our chapter is in King Salmon, Alaska. We call it the bush. Only way in and out is by plane or barge during the summer. We are on the Aleusian Isle that has a population of about 700. It is 17 miles from one end to the other. There are no movie theaters or bowling alleys, only a couple of restaurant bars. It is my month to host and after seeing your site I have chosen to give a scavenger hunt. There is plenty of history with the Red Hats. I hope you can help. Thank you. 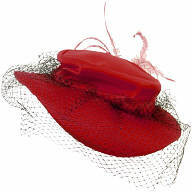 This Red Hat Society Scavenger Hunt is a combined photo and item hunt with a BONUS Challenge. 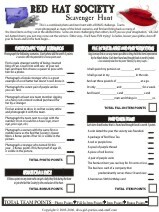 Divide into teams and be sure each team has a camera (preferrably digital), a watch, and a printable copy of the list below. Set a starting and ending location, as well as a time frame for completing the hunt (2-3 hours is a good estimate for this hunt.) Teams must photograph as many of the listed scenarios, and find and bring back as many of the listed items as they can in the allotted time. Some photos and items are more challenging than others, but if you use your imagination, wit, and red-hatted charm, you just might come out as the winning team. Either way... You'll have FUN trying. (2 scenarios offer the potential for 2 bonus points each). Find a male stranger worthy of being crowned King of Fun. Crown him with one of your red hats and have him choose a queen to pose with him for a photo. Photograph a female stranger who is a great example of a red hatter, but doesn't even know it. Photograph at least one team member sipping on a fancy red-colored cocktail purchased for her by a stranger. Find an animal to dress in red hat society attire and photograph it with the team. Photograph a women with the same first or middle name as the Red Hat Society's Queen Mom. 2 Bonus points if her I.D. is visible in the picture. Photograph a stranger who turned 50 this year. 2 Bonus points if his/her proof of age I.D. is visible in the picture. I shall spend my pension on ________ and _________. I shall go out in my _______________ in the rain. And eat three pounds of ______________ at a go. Or only ____________ and ____________ for a week. Each listed below that is found and brought back is worth 3 points. Any team who can get a lady they find during the hunt to join the Red Hat Society by the conclusion of the hunt will be given 10 bonus points..